ZTE have been in Canada for a while now. With a range of devices from low to mid-range, they have firmly entrenched themselves as the entry level phone manufacturer, yet they have never really released any upper-end devices—at least not before now. The ZTE Axon is the company’s first real foray into the flagship market in Canada, and for its price, the Axon is worth a look. Priced at $400 outright or free with a contract, the Axon is one of the cheaper phones on the market today. With a set of stunning design choices and solid mid-range hardware, it’s a worthy contender for your hard earned dollar. It may not be the most advanced device on the market today, but with a solid construction and a set of features that fit an active lifestyle, it is a phone that sets itself apart. ZTE may be known for their low-cost offerings, but looking at the Axon, you would not guess that. If you are looking for a device with a cheap plastic or a low-quality screen, this is not your phone. The Axon is a stunning piece of mobile technology, sporting a black on gold aesthetic and an overall high-quality feel. From the dual-tone aluminum back to a Corning Gorilla Glass 3 front, the Axon is a device that screams quality from the minute you first see it. The small triangle pattern grilles at the top and bottom of the phone fit nicely on the mainly black design, with the easy to access buttons for volume on the left and power and camera on the right. It all feels as if it was designed for how people want phones to be laid out, rather than how a committee decided they wanted consumers to use their product. The back camera of the Axon features a dual lense setup. The main camera is a 13-megapixel with the second 2-megapixel camera used to help with bokeh along with a depth of field and focusing effects. The front camera is a solid 8-megapixel shooter good for selfies or video chat. As stated earlier, the dedicated camera button on the right side of the phone is a pleasure to use, making the phone feel as much a point-and-shoot device as it does a phone. 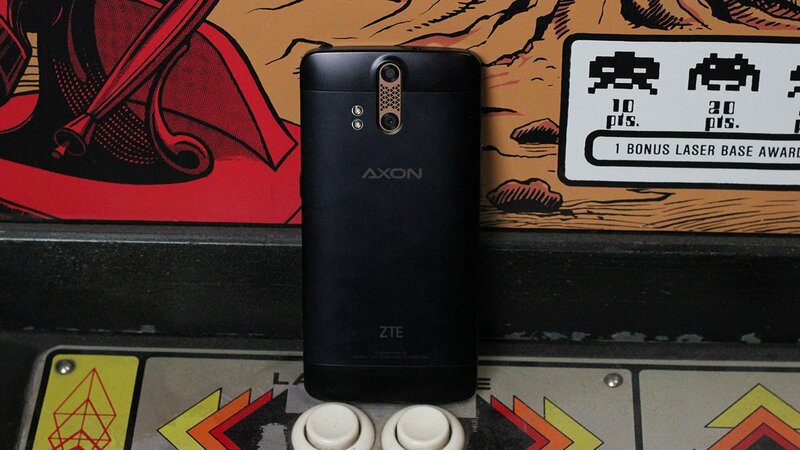 Even though the Axon may not be priced as if it were a flagship device, ZTE clearly wants to make it appear as one at first glance. You will not find any Micro-SD card or removable battery on the Axon. It features a 3,000mAh battery that is non-removable along with 32GB storage that cannot be expanded. This is not as bad as some phones on the market, but the fact that you cannot expand the storage means you may need to be selective on the games and music you have on your device. 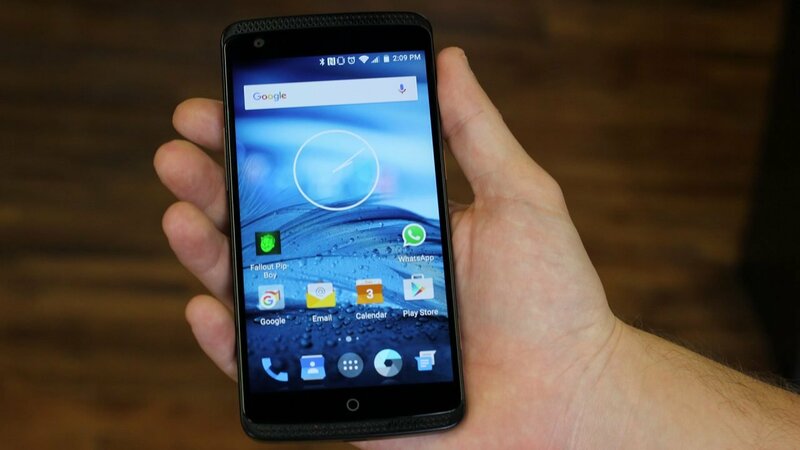 Under the hood, the Axon has a moderately powerful 2.3GHZ Qualcomm Snapdragon 801 quad-core processor with 2GB RAM. This would have been considered amazing a year or so ago, but with today’s Octa-core processors and phones with 3GB RAM, this is on the lower end of the power spectrum. For the majority of people, this would be more then enough, but if you do consider yourself a power-user, and like to have many games and applications open at the same time, this is something that may be a hindrance to you. 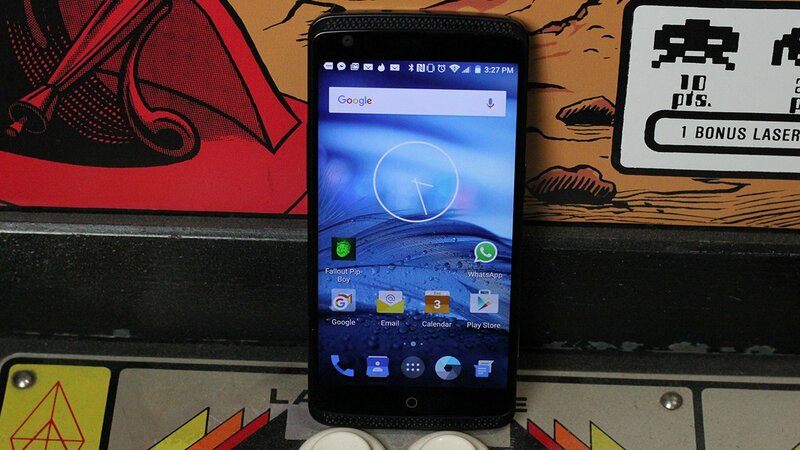 Despite the ZTE Axon Pro in the US coming with a 2K offering, the Axon in Canada only has a 1080P screen. This is not to say the screen is bad; quite the contrary. 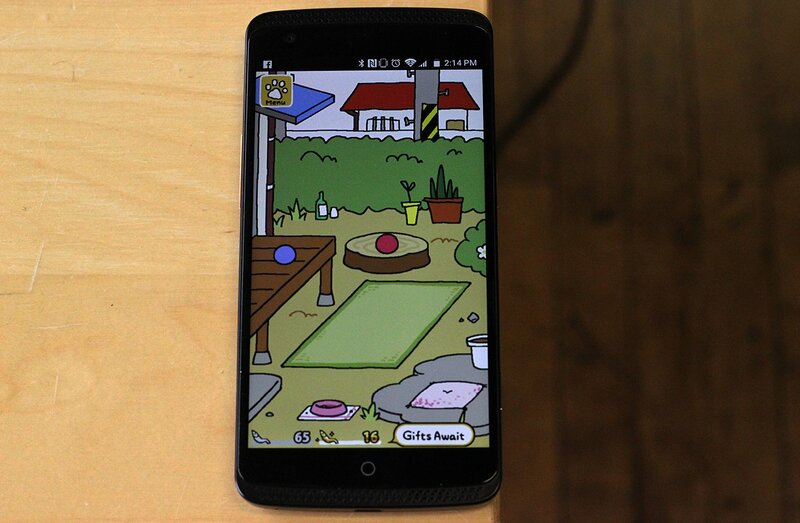 The 5.5-Inch 1080P Screen with a fair 401ppi (Pixels per inch), is crisp, clear, and vibrant. It is a pleasure to use, and while it may not be the best screen available today, out of the phones in this price range, this screen is one of the best we have tested. On the software side, ZTE has done what more Android phone makers should do and left the core Android 5.1.1 Lollipop experience relatively untouched. They have added a few select apps, along with their camera application, but for the most part, they have left what makes Android good alone, and avoided added unnecessary bloat to the core user experience. The camera on the Axon was good, but not great. The application it ships with gives the user a bit more control on the light allowed into the f/1.8 aperture sensor. In overall testing, we did not find this resulted in much better shots. Overall, the camera feels like a low-end point-and-shoot; it will get the job done and gives you a bit of control, but it’s ultimately only good for on-the-go shooting, and to get good shots you should still use a dedicated camera. The battery, on the other hand, in testing, was found to be fantastic. On average, with mild to medium use, it will last throughout the day without issue. If you are doing more gaming or using a variety of Bluetooth devices, you may need to give it a top-up before going out for a night on the town. For everyday use, you should have no problem leaving the safety of the charger and enjoy the freedom of using a mobile phone as is intended: away from the plug. Music and sound are one area the really Axon shines. With the help of a built-in DAC, the phone produces truly fantastic audio that would easily compete against any of the top-end flagships on the market today. The included JBL earphones are easy to use and better than most included audio accessories. For the audiophile, few phones come close to matching the performance you will get from the Axon. It is astounding that for $400 the device can produce such clear and crisp audio; even out of the built-in speakers, it sounded fantastic. As mentioned earlier, the Axon is not the most powerful phone on the market. 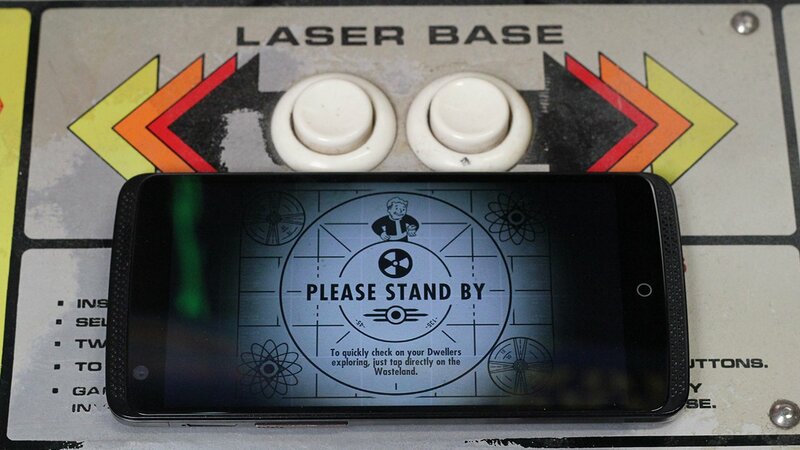 That being said, for the majority of games available on android now, it will be more than serviceable. The bright, crisp screen makes gaming a joy, and the powerful battery ensures you will not be killing your phone if you play a game on your commute. In testing with the usual slew of games including Asphalt 8 from Gameloft, Fallout Shelter from Bethesda Softworks, and Clash of Clans from Supercell, we saw no real issues with performance. While many games where open there was a bit of lag, but the games, for the most part, played as they should with the overall experience easy and enjoyable. The Axon may not be a powerhouse, but it will service the casual gamer with ease. The Axon is in an odd place; it is clearly designed as a flagship, but the fact it has slightly older tech and lacking top-of-the-line components really holds it back. But for the price of $400 outright, it is a hard phone to beat. For the person on the go, to someone on a budget, the Axon is a sure-fire hit. For someone that demands the latest in power, though, they may want to consider to other options. For the person on the go, to someone on a budget, the Axon is a sure-fire hit.